Central and North West London (CNWL) are the largest NHS Mental Health Trust of its type in the UK, with 96 units housing over 900 beds. CNWL cares for patients with mental health illnesses ranging from cases of dementia to alcohol and drug dependency, as well as units specialising in psychiatric intensive care. During 2015, Renray Healthcare was contacted by CNWL to discuss the standardisation of Mental Health beds and mattresses across their 96 units in London, and as far north as Milton Keynes. From January to April 2016, Renray Healthcare audited over 650 beds and mattresses across the Trust, collating information regarding the type of bed, its condition and its location. Discussions took place regarding the type of bed that should be used in each location and a comprehensive assessment of all products available in the [healthcare] beds and mattress market was completed by both parties. As a result, ‘show and tell’ days were organised in order for CNWL to inspect the beds personally, allowing them to make their own informed decisions regarding which beds met their needs and expectations. This also gave CNWL the opportunity to understand how the beds and mattresses worked –a valuable experience to the client. This was shortly followed by a consultation with CNWL to finalise the designs of the products they had chosen to use within their Trust. 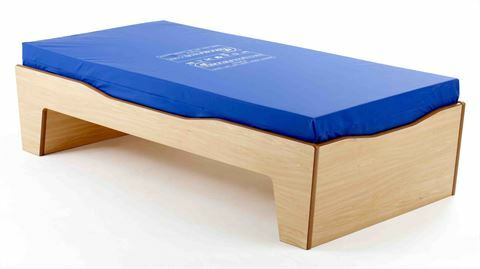 These products included the JETBED and CRIB7 – a fire retardant, anti-vandal, wielded seam mattress. In December of 2016, CNWL placed an order for 35 Profiling beds, 29 High Risk of Pressure Reducing Mattresses, 231 JETBEDS and 129 Jet Matts. Within this project an agreement was reached regarding the removal and disposal of old mattresses and beds, upon placement of the new products. Renray Healthcare agreed to dispose of old beds and mattresses to alleviate the added stress and pressure for CNWL disposing of the equipment themselves. This also ensured safety standards and regulations were met. All metal parts were recycled and mattresses put into clinical waste. When removing furniture, it was crucial at least 5 men entered the premises or area of refurbishment to ensure safety whilst on site, with no members of staff being left without the watch of a qualified nurse. All our employees are fully DBS checked and male and female units were approached with caution and sensitivity. It was also essential that CNWL ensured a safe route of access in and out of the building, to allow for a straight-forward and streamline process of delivery and installation. Project management is a key element within the running of any forecasted plans and this played a crucial role in determining the success of this project, and the overall outcome. The environment was complex and security was essential for the success of this project for Central and North West London. All staff, including Renray Healthcare, ensured sensitivity to patient needs at all times and were conscious of their surroundings 24/7. Variable factors, such as, protected patient lunch hours and medication rounds were taken into consideration during the installation. Consolodation of Central and North West London’s 12 different types of beds and mattresses resulted in the successful implementation of a newly reorganised bed and mattresses portfolio; made up of only 3 different types of products. Over 300 beds and 180 mattresses were delivered to the Trust between February and August 2017. The overall success of this project has positively resulted in a two year contract between Central and North West London NHS Trust and, Renray Healthcare and we are currently the sole supplier of beds and mattresses to this specific foundation.